For many summers between 1950 to the early 1960’s our family vacations were on Sebec Lake in Central Maine. 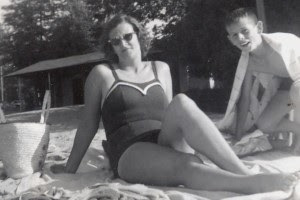 The photo with Mom on the beach at Greelys Landing on Sebec Lake was probably around 1957 and shows the snack shop in the background. Frozen candy bars were a great treat. The clean sandy beach was about 300 feet wide and extended about 50 feet from the shore. The huge parking lot was filled mostly with outta staters, and us kids had contests finding the car from the longest distance away. For transportation our family of 10 arrived by boat which usually took two trips. The level of Sebec Lake at Greelys Landing stays shallow for some distance which is perfect for toddlers. Another feature was a long diving pier where I once cheated death trying a sailor’s dive off the end into about 5 feet of water. For the uninitiated a sailor’s dive is used in the Navy for jumping from tall ships with both hands held to your side much like a penquin. I believe my motivation was either a military show on tv or antarctic nature program combined with the ignorance of youth. I’m fortunate to be here to write about that dive because just my head hit bottom and it was like a crowbar dropped in a shallow bucket. Our camp was down the road apiece, so as dusk approached our family was often the last to leave. The treasures of last minute beach combing were pretty cool as we collected towels, flip flops, or whatever else that hours earlier belonged to some mindless outta stater who was probably half way to New Hampshire. As I recall years later, our family never did pack many towels going to camp, and had plenty of beauties on the return home.